JOHN HAMLYN. We believe our Hamlyns to be descended from the following family. Moretonhampstead is a market town on the eastern edge of Dartmoor. Early tax rolls show that the Hamlyns were a well-established family in Moretonhampstead from at least as early as the 16th century. This shows them to be workmen rather than landowners. Wages or goods of £1 were the lowest at which tax was payable, but many were too poor to pay tax at all. This shows these Hamlyns to be neither among the richest nor the poorest in the parish. £2 William Hamlyn of Clifford, £1 William Hamlyn of Leyne. Clifford was near Clifford Bridge, on the River Teign. 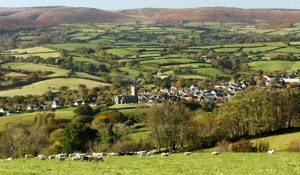 It is separated from the town of Moretonhampstead by the heights of Mardon Down. We have not been able to identify Leyne. The name means an arable enclosure. The association with a place probably means that the Hamlyns were now farming. 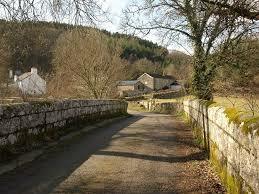 Clifford Bridge was not built until the 17th century, and then it was narrower than now. Before that there was probably a ford and possibly stepping stones. We know very little about John Hamlyn senior of the 1614 baptism. The Moretonhampstead registers have only survived from 1603, too late for his own baptism. If John junior was his first child, we should expect John senior to have been born around the 1580s. This means that he may be the son of William Hamlyn of Clifford or William Hamlyn of Leyne. He probably grew up to be a farmer. We have not found his marriage and we do not know his wife’s name. John junior’s is the only baptism for a child of John Hamlyn around this time. It is possible that the family used another church. Or perhaps one of the parents died soon after young John’s birth. The Moretonhampstead registers begin in 1603, when James I succeeded Queen Elizabeth. Hamlyns appear frequently from the start. Lawrence Hamlyn is having children baptised in these early years. He could be a brother or cousin of John Hamlyn senior. Lawrence died in 1615. There is only one man named John Hamlyn in the 1642 Protestation Return for Moretonhampstead. This would appear to mean that John Hamlyn senior was dead by then. There is a possible burial. 1626 Jun 8 John Hamlyn sen.
His son John junior would only have been only 12 then. The entry may suggest that there were two adults named John Hamlyn, so this could be the burial of an older man. On the other hand, we have found no other burials for John Hamlyn before 1642, though there are some gaps in the register.